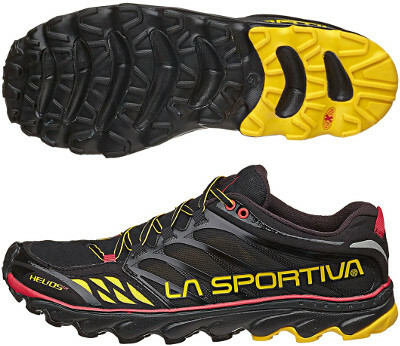 La Sportiva Helios SR are neutral trail running shoes. The energetic La Sportiva Helios SR is a perfect choice for racing short/medium off-road distances, what italian brand names "Sky Running" (although it seems "SR" stands for "Sticky Rubber"). Despite thick midsole it is a pretty light shoe with just 2 mm drop therefore good running technique is mandatory in order to get full advantage of Helios SR. It performs better on solid and dry terrains (specially rock) so better go for Anakonda if running on muddy ones. Upper from Helios SR is based on high breathable mesh combined with simple plastic structure for snug fit. Bootie construction with gusseted tongue delivers soft feel and prevent debris and dust from jumping inside while reinforced toe bumper protects from external elements. Removable 4 mm Ortholite™ insole provides not only extra cushioning but also moisture management and antimicrobial properties. There is no "classical" rigid rock plate but compressed EVA layer ("Endurance Platform") just below insole features flexible protection against sharp elements particularly in the forefoot where it is 3 mm thick. Proper generous midsole in Helios SR is made of reliable injected EVA combined with Morpho Dynamic™ technology to better adapt to rough terrains. It uses dual rubber Frixion XT sticky outsole with softer one in front and midfoot for increased traction and grip while rearfoot features a harder one (in different colour) for more durability.